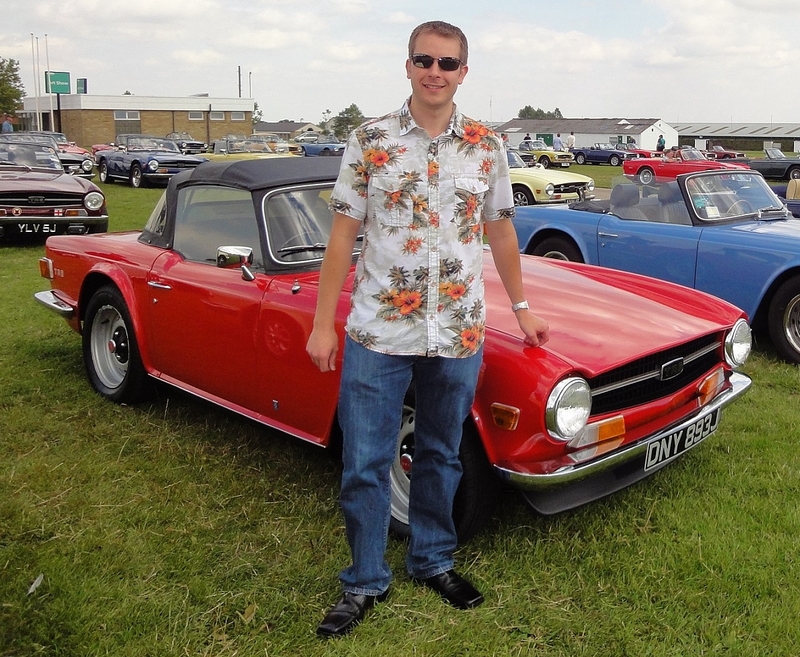 his page provides details of Red Rose Group members and their cars. Click here for information on how to add your details. 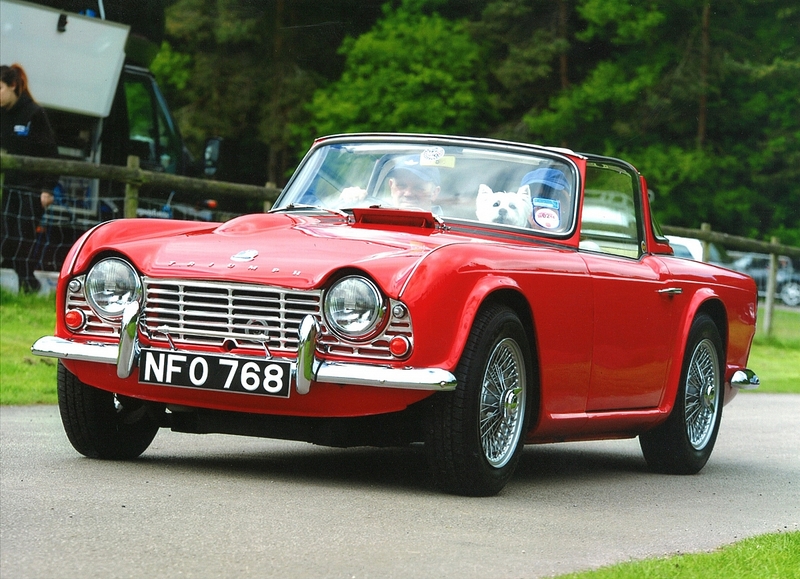 1962 Red Triumph TR4 Surrey Top. 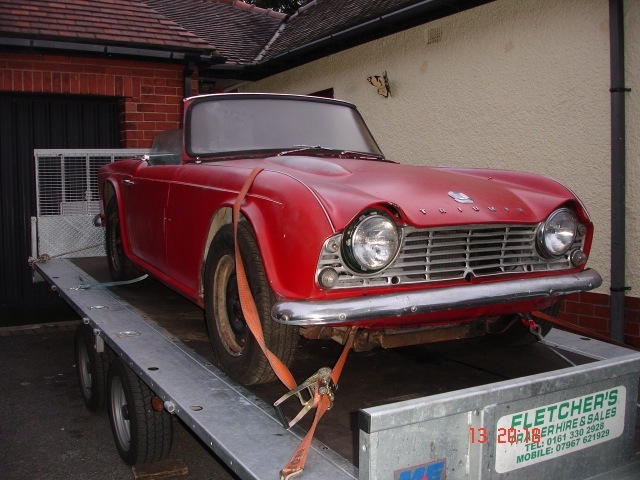 Exported to Texas 2 January 1962 and repatriated in 1992. 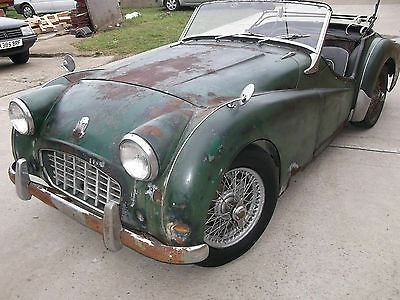 1957 British racing green Triumph TR3 currently residing in long term storage. 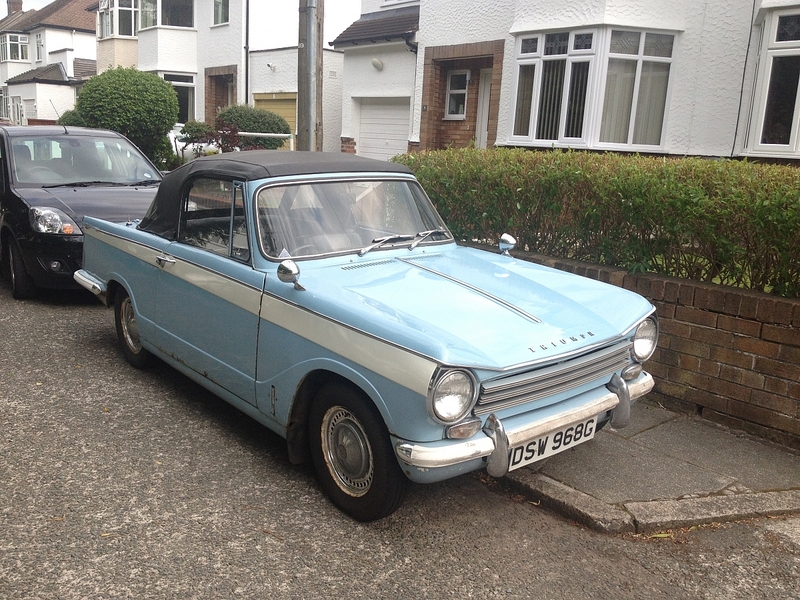 1957 Triumph Herald 13/60 convertible - ongoing restoration. Back to metal respray in 2014. 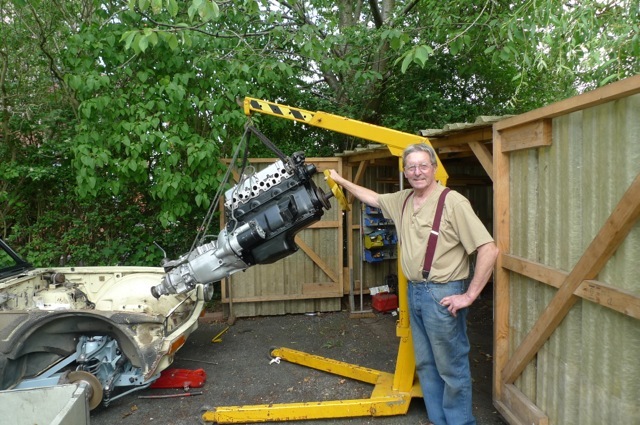 Complete engine rebuild in 2017. 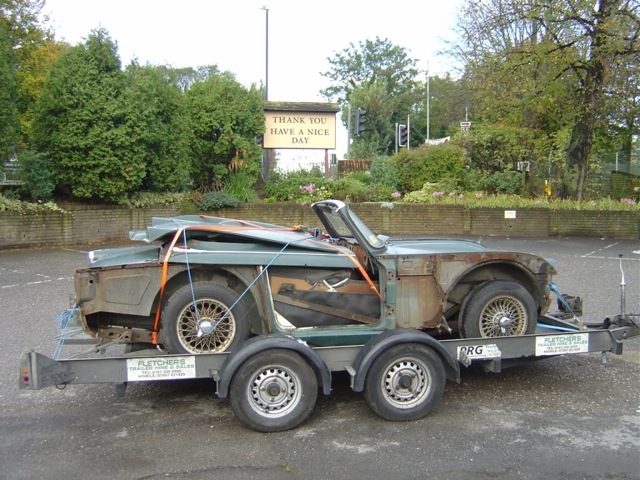 Started life as a green left hand drive and was manufactured in January 1966 and shipped from the Queen Alexandra dock in Cardiff aboard the ship 'Brynje' to America, her destination was to the dealers Genser & Foreman Inc. New York. The first owner was from Greenville, South Carolina. 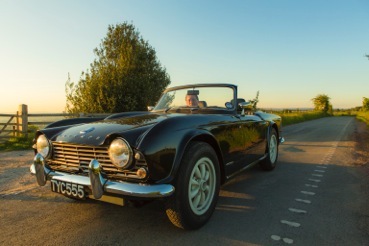 She lived for 24 years stateside before being shipped back to England where she was converted to a right hand drive and resprayed blue. She spent the next 20 years in Stoke on Trent and then Burnley before we were lucky enough to purchase her in 2010. 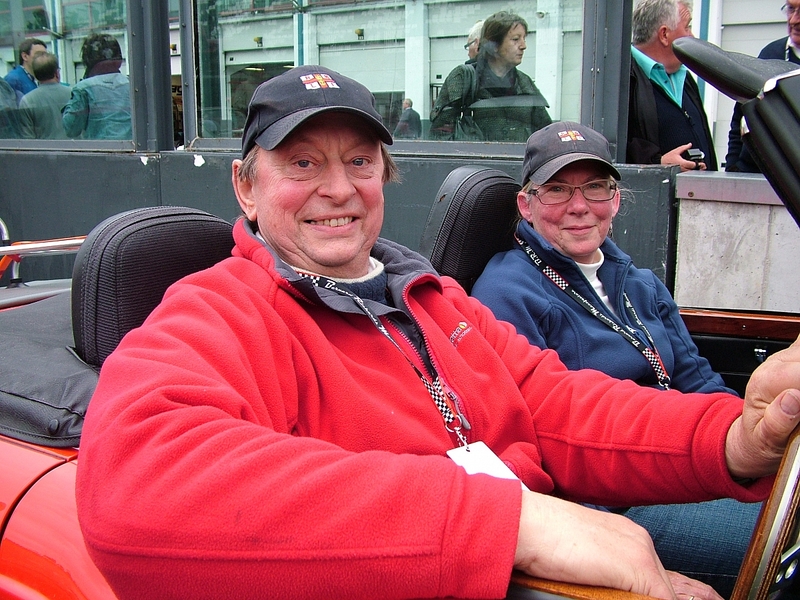 We have been members of Red Rose for 25 years and have owned DUD for 20 of those. We have also had several other TR's during this time some of which are in the pictures. 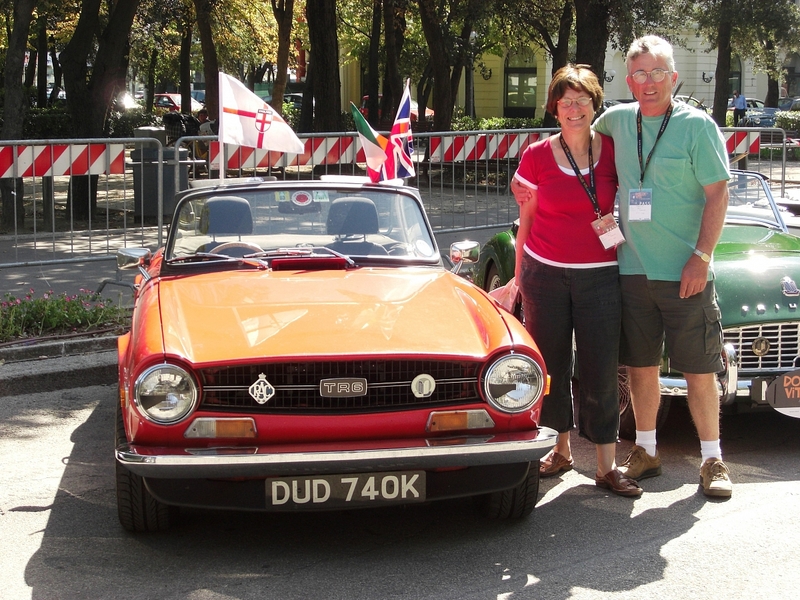 Touring in the UK and Europe is something we particularly enjoy either by ourselves or on events organised by the club. iii. One that I bought earlier? iv. This one I gave away!! 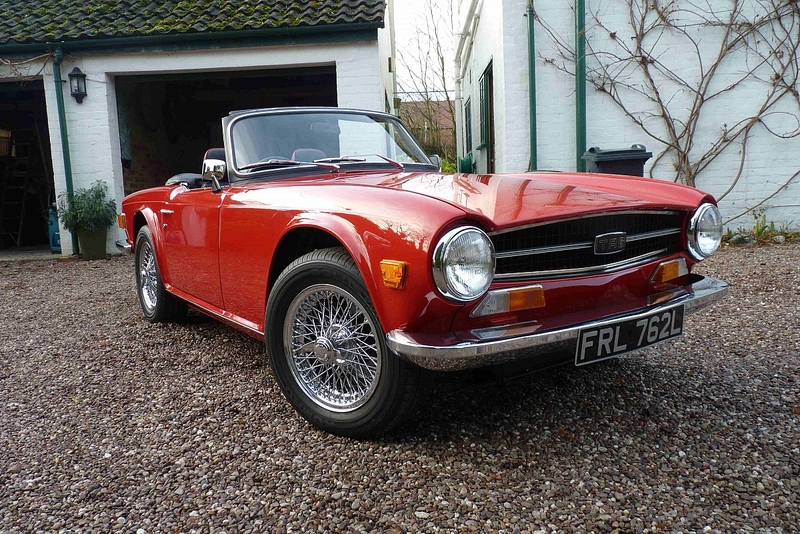 Owned Since: Late 1975 or early 1976. 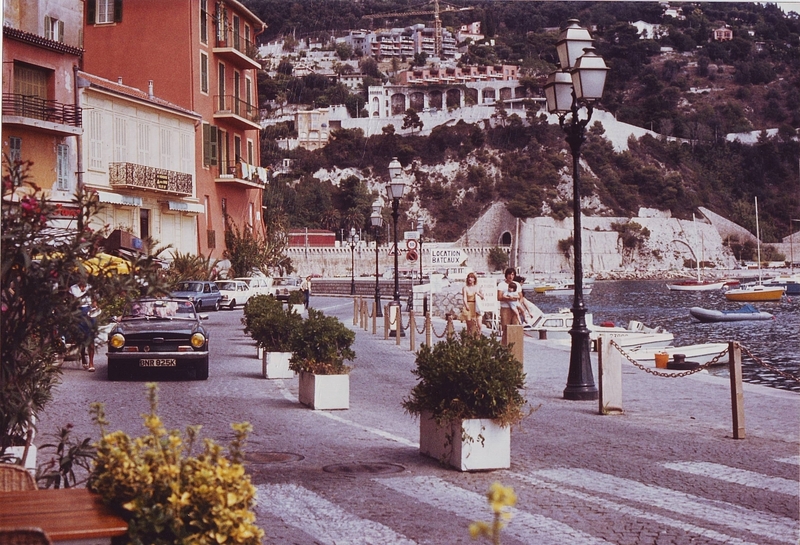 It was a long time ago and used as daily drive up to the end of 1989. Sweden, I lived there in 1984. Norway a tour on the way back to UK from Sweden. 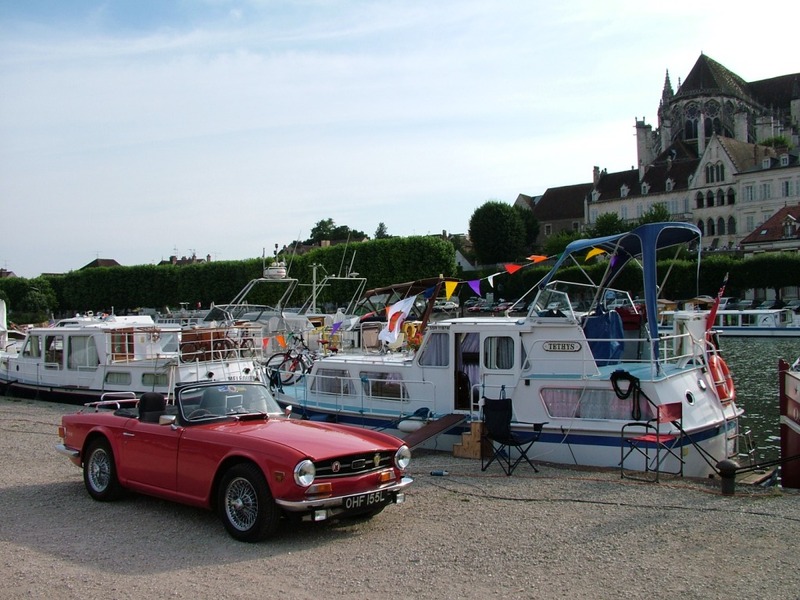 Photo taken in the Champagne region on the return journey from France in 2007. 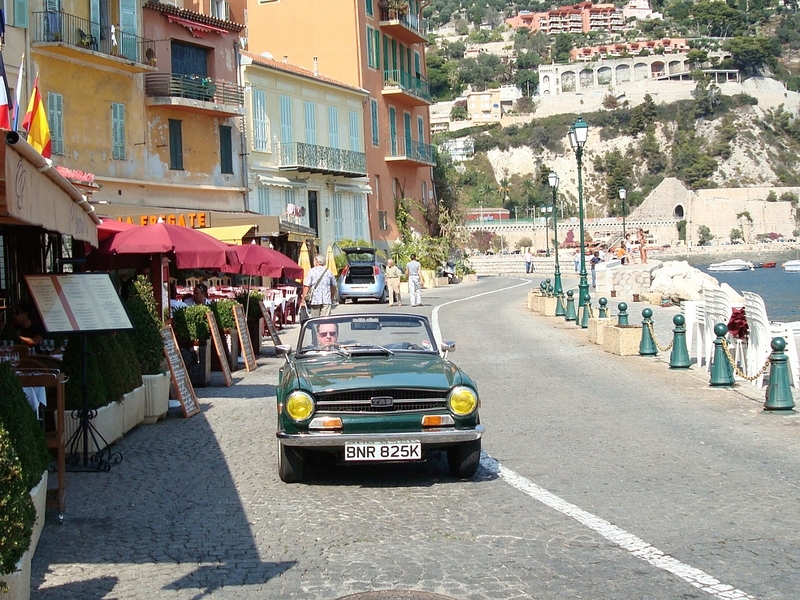 The following photo is from the 2007 trip and was taken to be as close as possible to a photo taken on the 1982 trip. 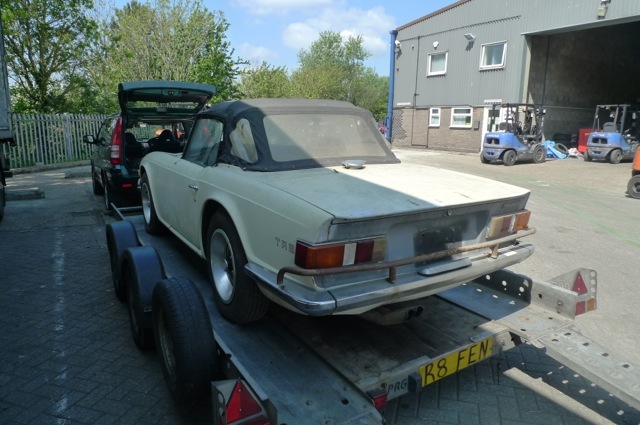 I have had TR's since I was 19, I am 71 now and renovating a TR6 from Tallahasse. 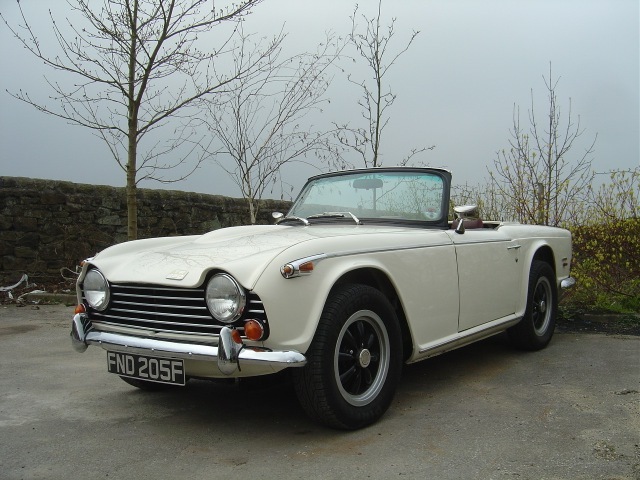 I can't remember how many TR's I have had in 50 years but the cheapest was £30 and the dearest $6000 before I renovated them. 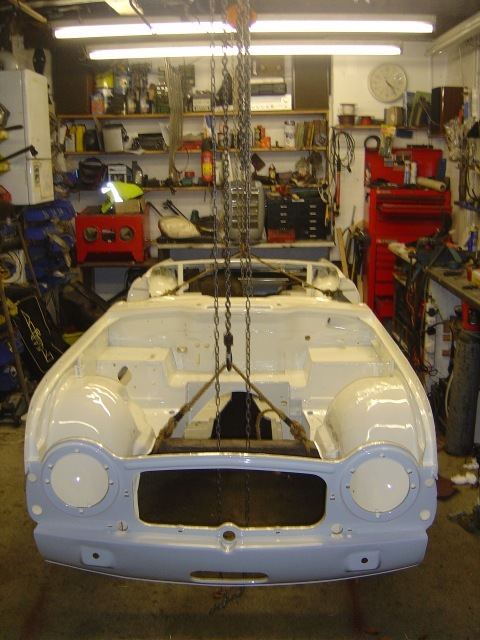 Here are a few pics of recent rebuilds in the last 15 years or so. 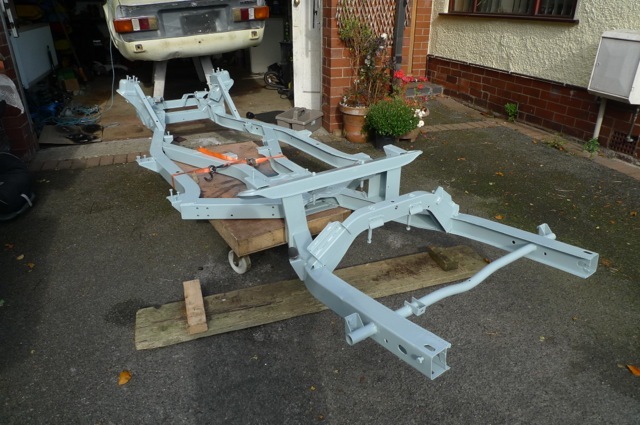 i. TR6 from Talahasse as bought and still in progress. ii. Before and after pics of my TR3A bought from TR Bitz. iii. 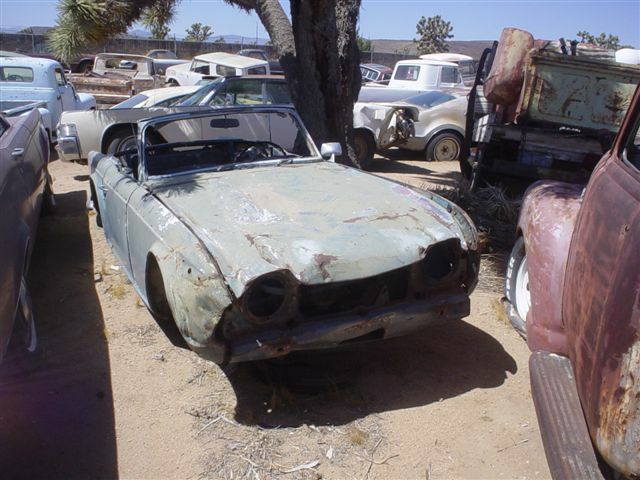 My TR4 bought from Arizona. 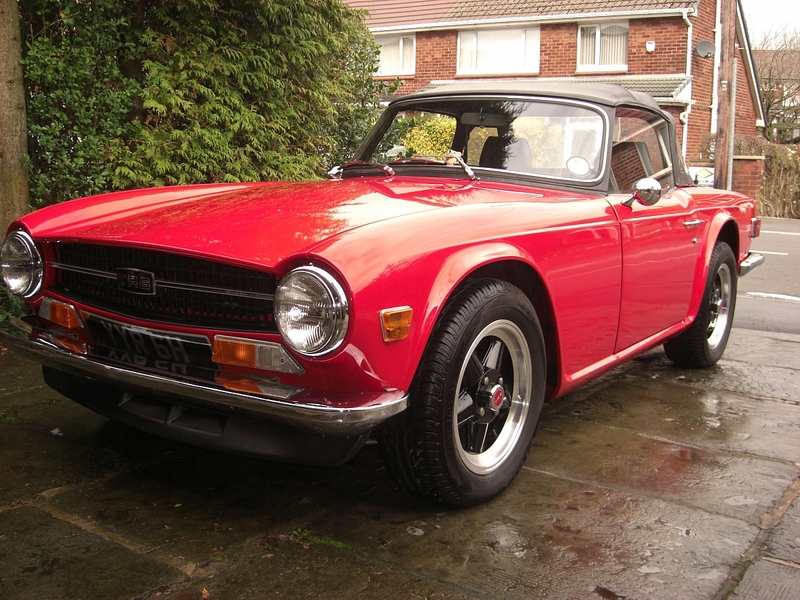 Before, during and after, sold to buy my De Tomaso. iv. 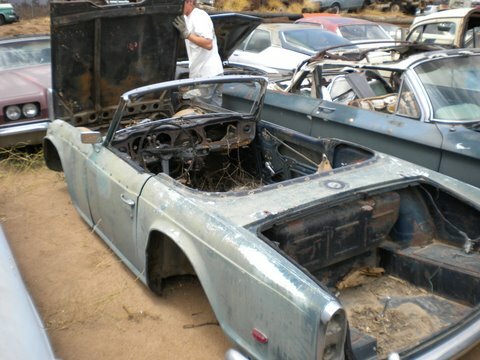 TR250 from Maine USA with body so bad, found one in a scrap yard in California. 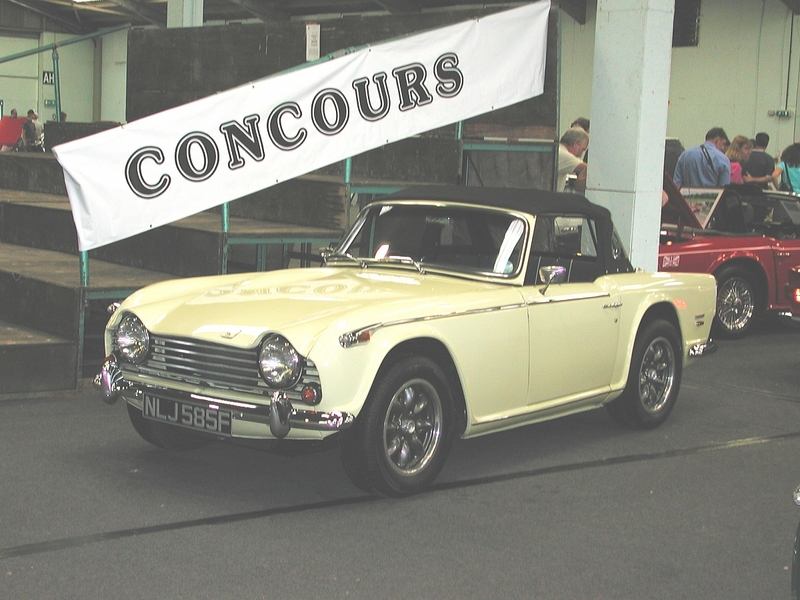 I think it sadly may be posing as a TR5 now!! 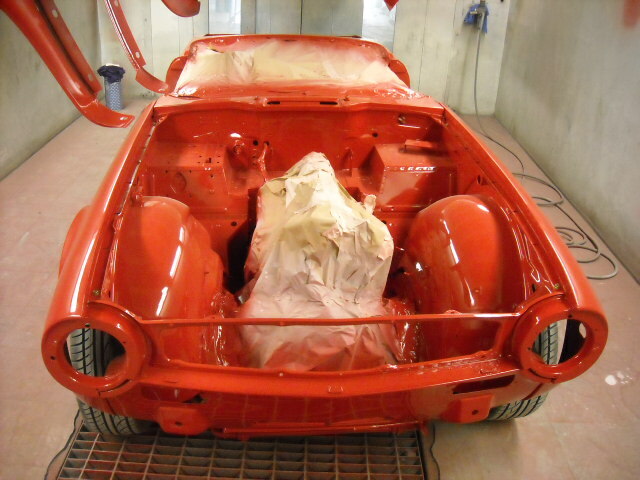 The body was stripped, some panels replaced and repainted in Triumph Signal Red. As part of the rebuild, some, I like to think sympathetic, modifications and improvements were made. 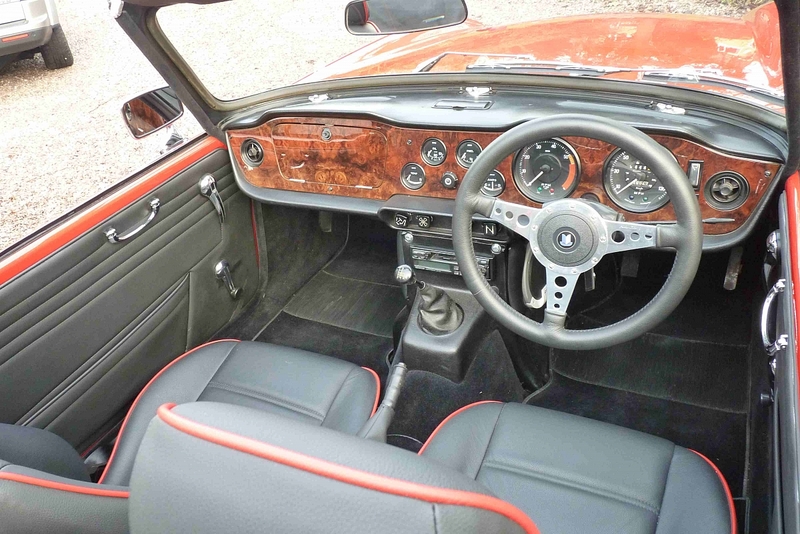 Wire wheels, walnut dash, Mota-Lita steering wheel, MX5 seats (I have the originals), polybushes and spax dampers, Kenlowe fan, electronic ignition. 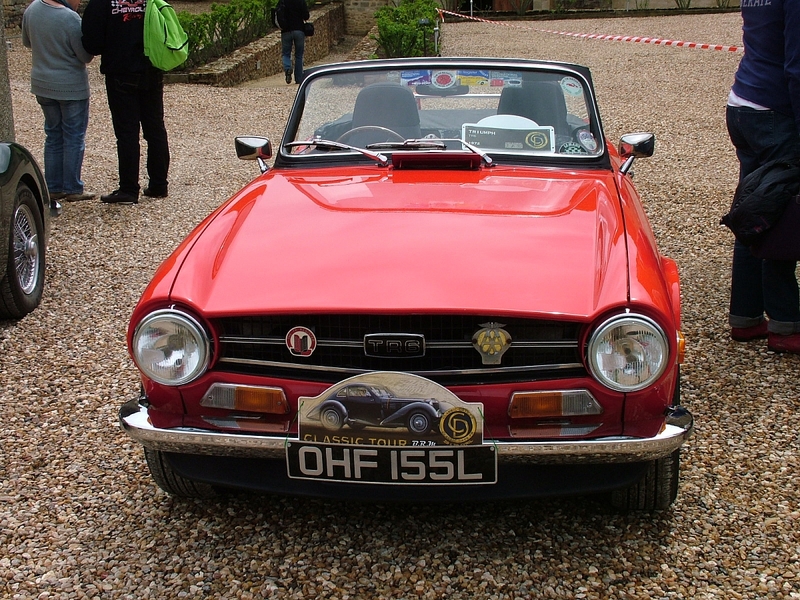 The interior was re-rimmed and a new hood fitted. I have added mesh headlamp protectors because they look period cool and a power socket for the sat nav. 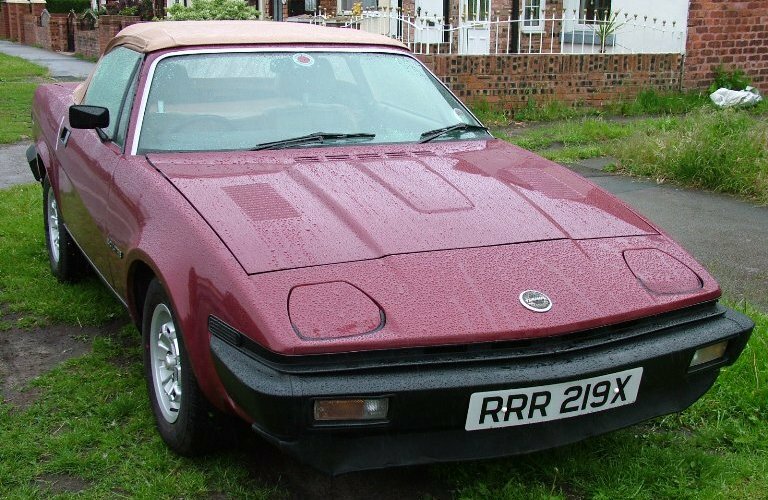 It has proved to be very reliable, only a diff leak and failure of the windscreen washers (never used them! Only a pre-MOT check over showed them to have failed) have blotted the copy book. I did get the speedo and tach re-calibrated as they were way out. 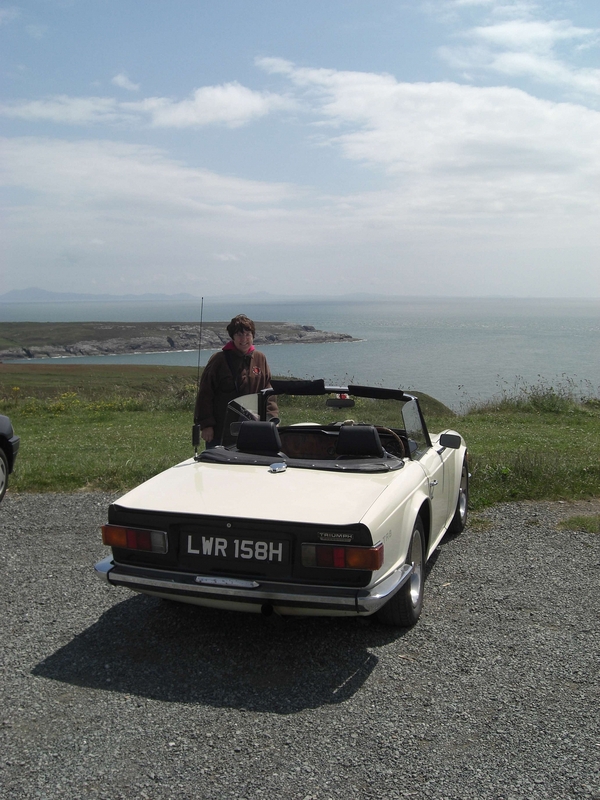 I have not taken the car abroad unless you count a run down to South Wales zigzagging in and out of England and Wales on some fine B roads. It's a car that sounds good but actually isn't going very fast even when you think it is, which means you can have fun without contributing to speed taxes. 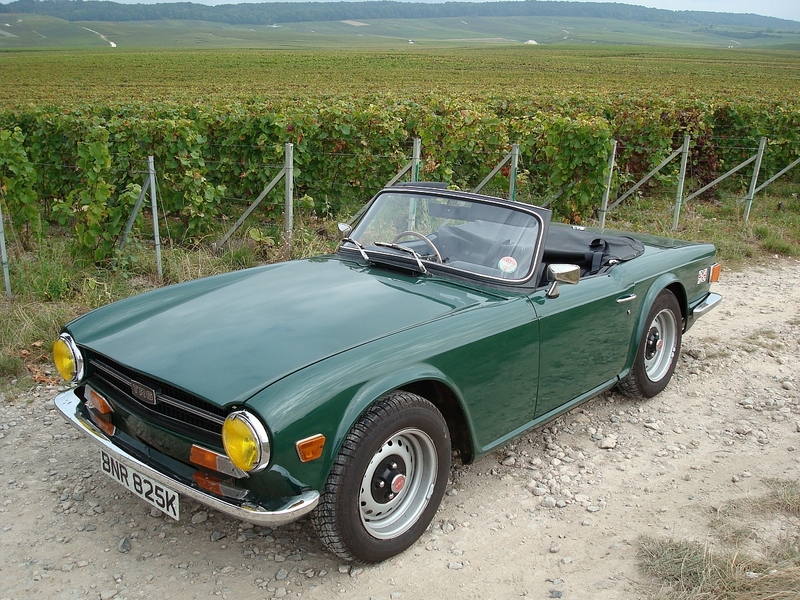 Took it off the road in 1984 and was rebuilt and back on the road in 2006. 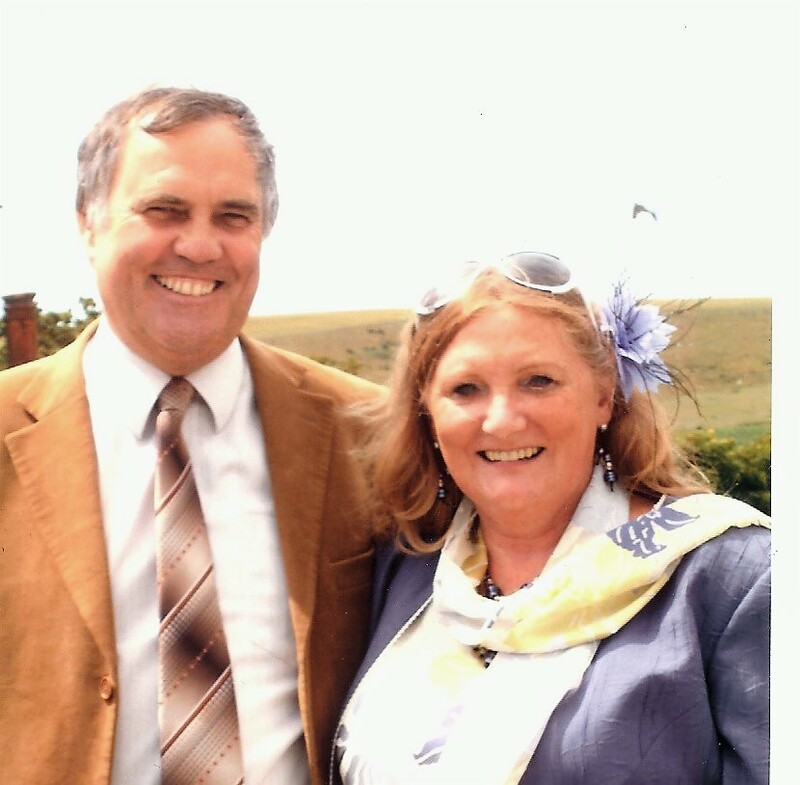 Been a member of the Red Rose Group since 1980 but lost touch with the meetings around 1990. 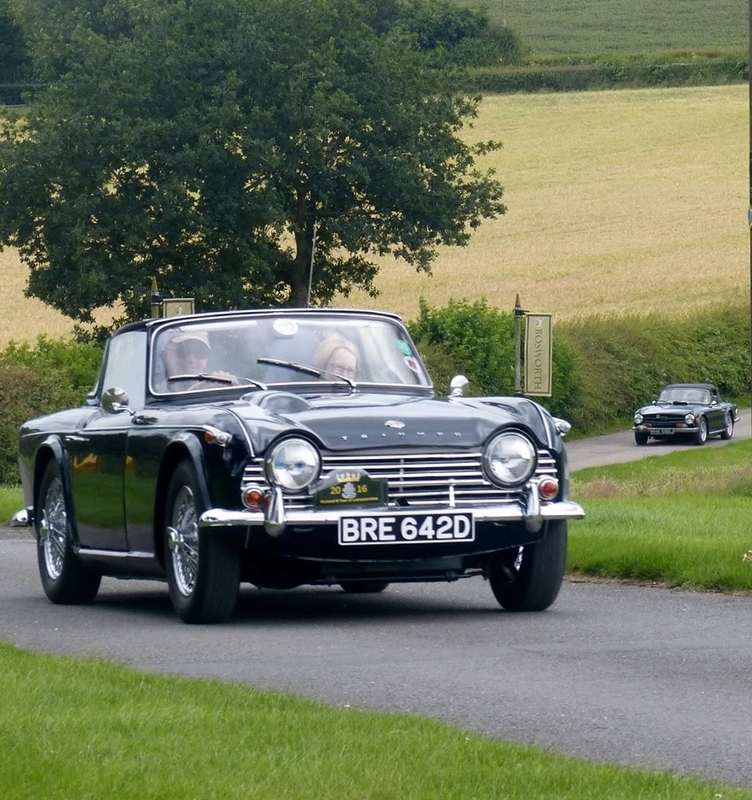 Saw the TR's at the lakes weekend in 2005 and Hazel said why didn't I get my TR6 back on the road and so I did and we went back to the Red Rose monthly meetings at Antrobus. 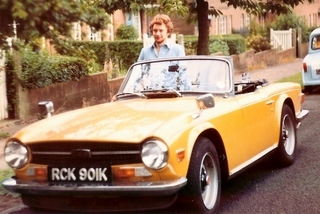 I bought my first TR6 in 1978 (yellow TR6 photo below), only had it for a few years, everyday car used for work. 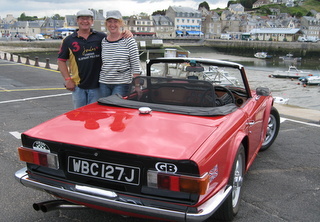 Owned since May 2003 when we joined the TR Register and came to our first Red Rose meeting. 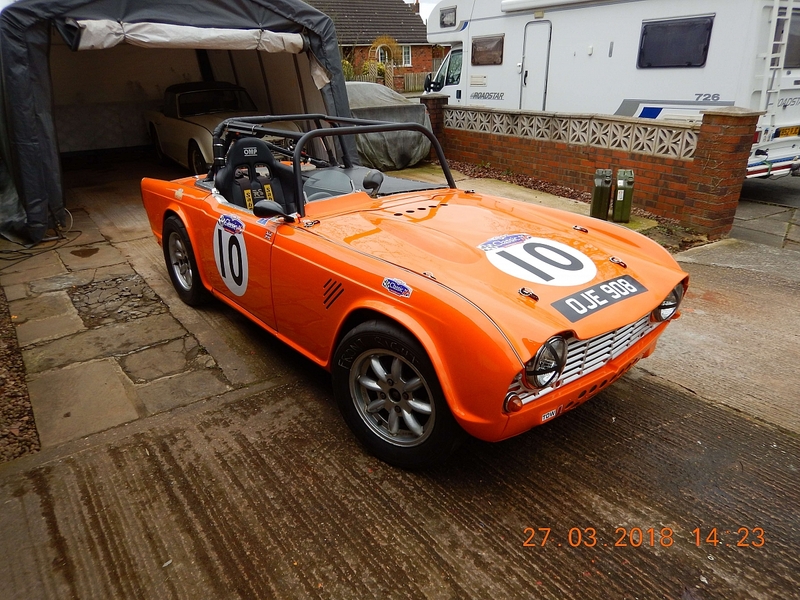 Since 2003 a lot of mechanical upgrades have been done culminating in a body off rebuild in 2011 together with fitting of MX5 seats, new carpet set and mohair hood. 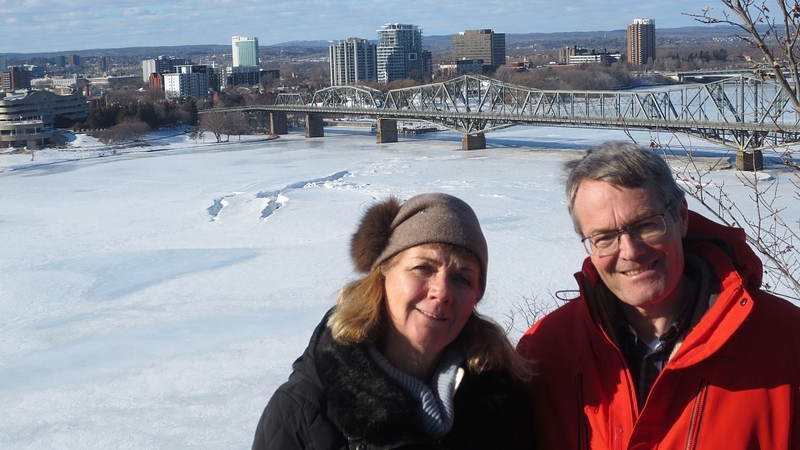 For some years in the early days, our only means of transport. Used regularly whilst living in Germany during the 1990s. 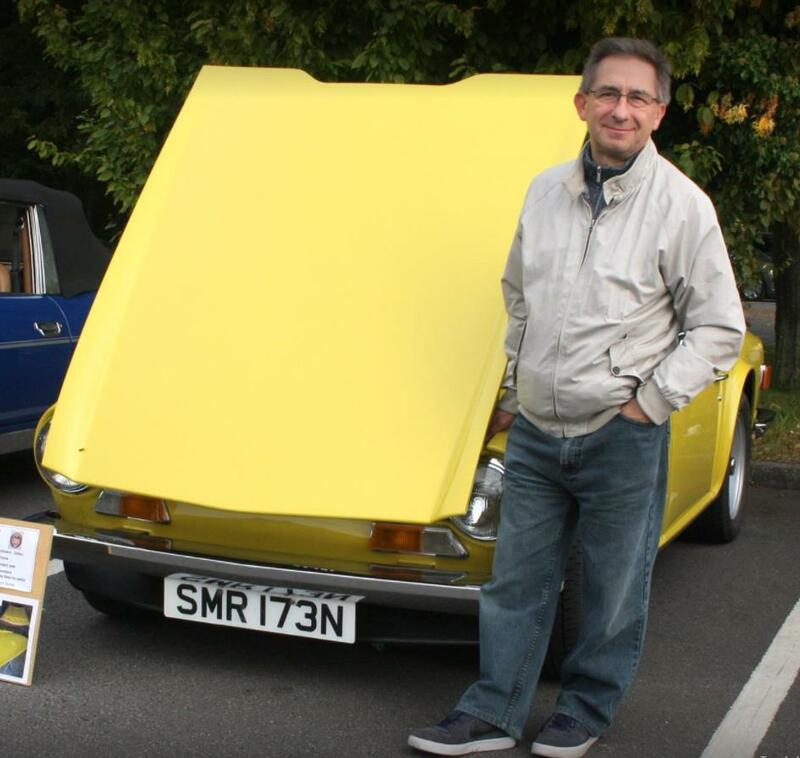 I've managed to do all the restorations and servicing myself over the years (as you can probably tell!). 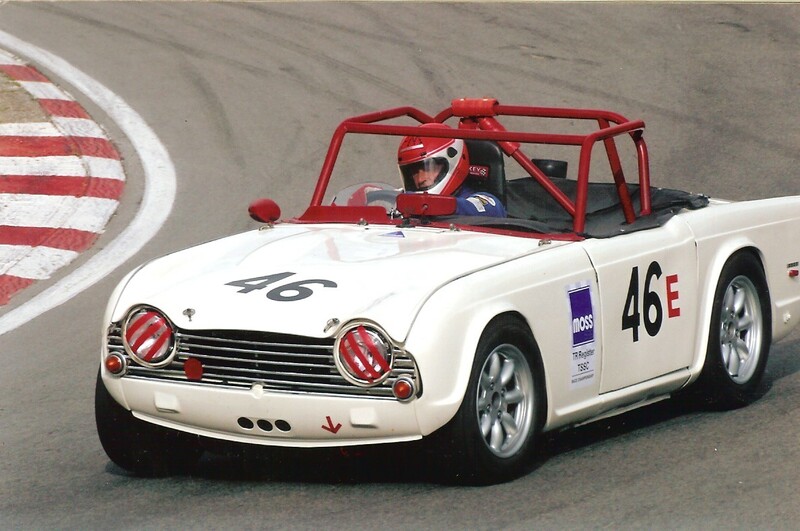 TR3 Beta Replica, bought from Julian Furness, in 1985 (complete with trailer), for racing in the TR Register Race Championship. 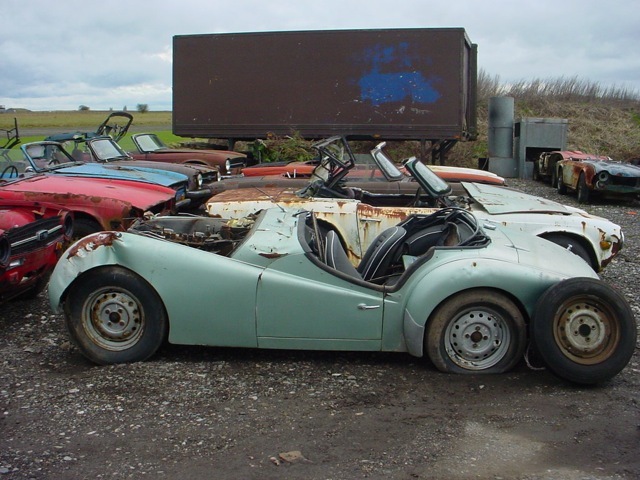 Wrecked that at Castle Combe in 1987. 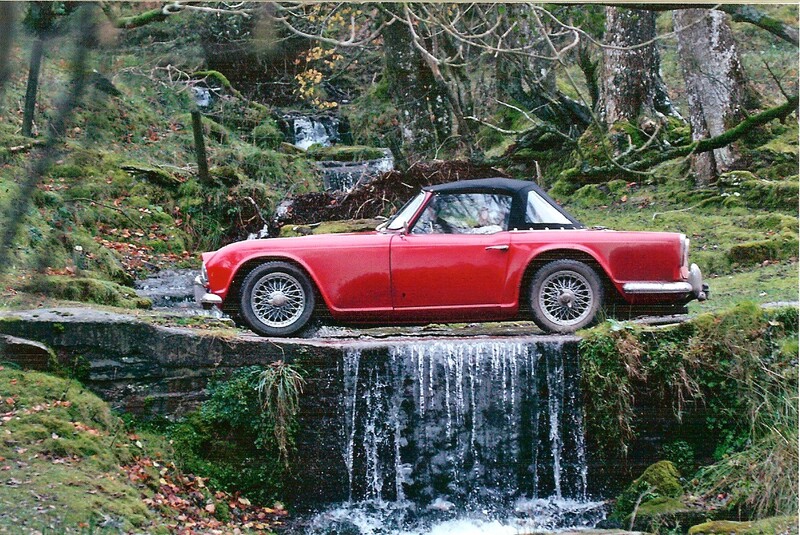 TR4. OJE 908. 1963. 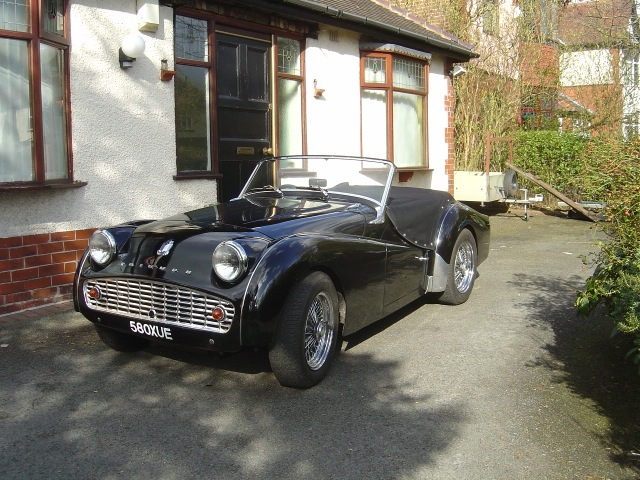 Bought as a 'basket case' from Geoff Mansfield at The Northern TR Centre in 1987, built into a race car to replace the TR3 Beta. Still owned and raced. 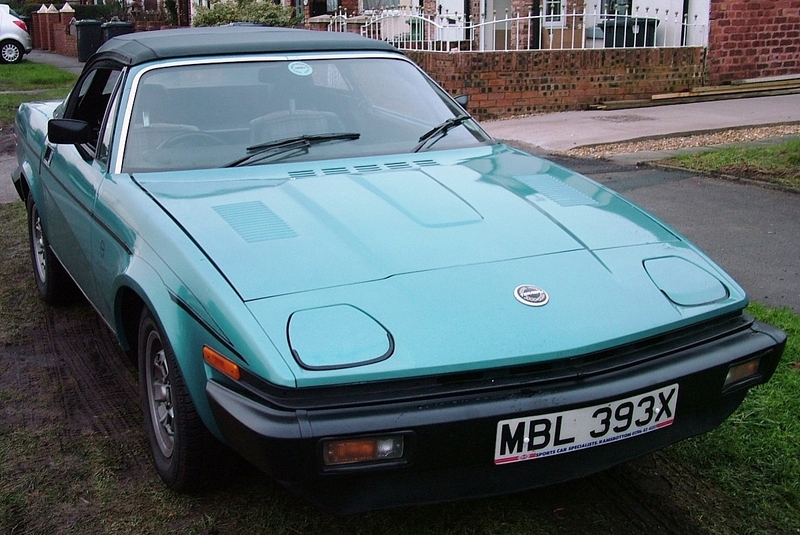 TR7. 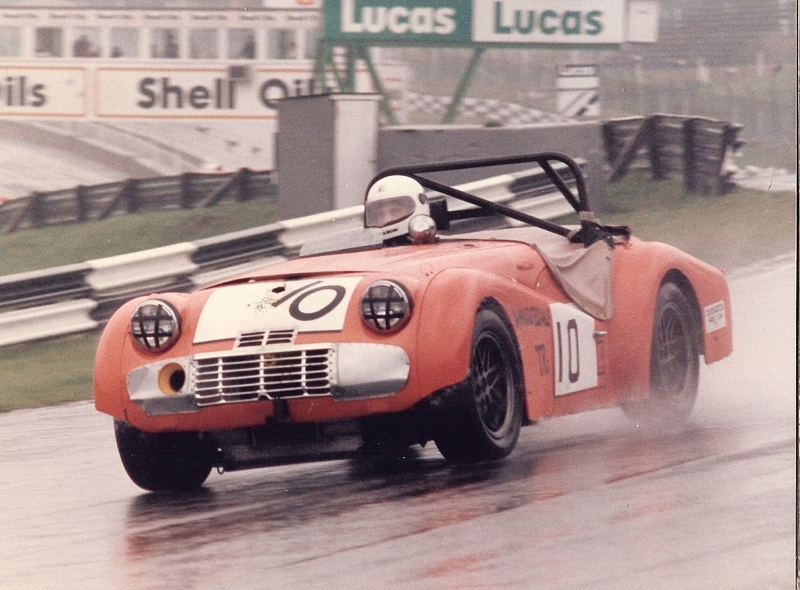 RRB 500R. 1968. 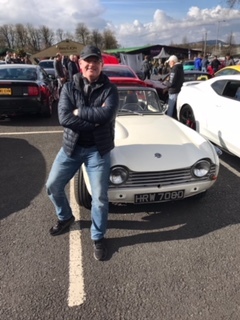 Bought in 1993 and completely rebuilt as a race car for my son Simon to race, which he did for a while in the Championship, but then turned his attention to Motorbikes. So I now have the car blocking up the driveway. 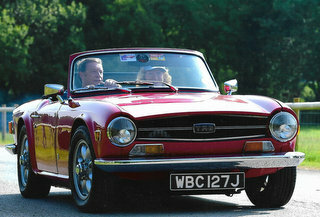 TR5. LKV 878F. 1968. 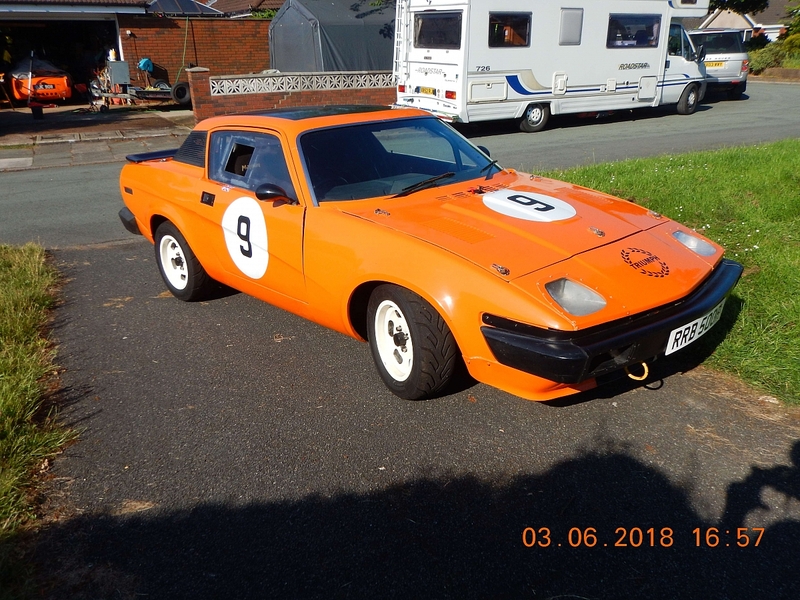 Bought from Mike Hughes in 2018, as a re-build project, someday.